The objective of this paper is to look for structural designs arising from topological optimization procedures that aim at maximizing the loading capacity regarding incipient plastic collapse. The mechanical problem is described by limit analysis (LA) formulation that allows a direct determination of the load that produces the plastic collapse phenomenon without information about the load history. In case of proportional loading processes, LA consists of computing a critical load factor such that the structure undergoes plastic collapse when the reference load is amplified by this factor. In this case, LA can be cast mathematically as a convex constrained optimization problem. The design optimization is formally stated as the maximization of the collapse load factor subject to a fixed quantity of available material. The design is controlled by solid isotropic microstructure with penalization (SIMP) technique. In the particular case of the chosen objective function, the solution of the adjoint problem in sensitivity analysis coincides with the Newton–Raphson update vector obtained at the convergence of the procedure developed to solve the LA optimization problem, fact that reduces the numerical cost of gradient calculations. 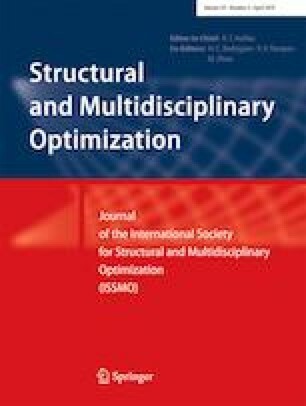 In order to keep the implementation straightforward, the optimality conditions are solved by a classical heuristic element-by-element density updating algorithm, well known in the literature. The set of tested examples brings encouraging results with structures being stressed to ultimate bearing states. Implementation was kept as simple as possible, leaving the field open to further investigations. Numerical tests show that, despite having similar geometries, plastic collapse factor obtained with compliance optimal designs are lower than those obtained with present formulation.